ISLAMABAD – One of the officials of Islamabad police taking part in Faizabad operation to disperse the protesters staging a sit-in in the capital, has succumbed to his wounds while hundreds of security personnel and protesters have sustained injuries. Police sources said the official lost his life after a head injury registering the first casualty of the operation launched after the deadline to call off the sit-in ended on Saturday (on 20th day). Before starting the operation, Deputy Commissioner Islamabad Captain (r) Mushtaq told newsmen that the orders had been passed in line with the directives of Islamabad High Court and Supreme Court. Asmatullah Junejo, the assistant inspector-general (AIG), stated that the Faizabad area would be cleared by today (Saturday) affirming that “police will try its best to make sure there is no fatality”. After the instructions, police, a heavy contingent of Frontier Corps and Rangers started the operation which is still underway. The law enforcing authorities removed the barbed wire fences surrounding the sit-in area and are using tear gas to disperse the demonstrators. As many as 370 protesters were taken into custody by the law enforcers. The police also resorted to baton charge and many of the law enforcers were left injured as the protesters pelted them with stones. According to Pakistan Institute of Medical Sciences (Pims) administrator Dr Altaf, 67 injured have been brought to the hospital. 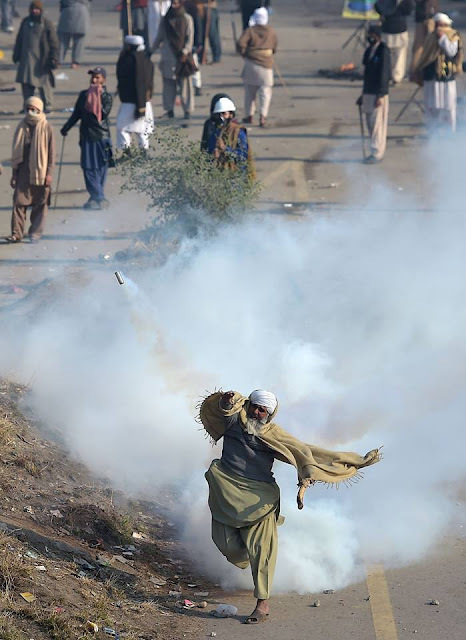 They include 27 protesters, 27 officials of Islamabad police and 13 FC personnel. Station house officer (SHO) Banigala Zulfiqar and Abdul Hadi, a magistrate of Islamabad administration are also among the injured. Moreover, the police are also using water cannons to diffuse the protest, however, the members of religious groups appear prepared to retaliate as they are armed with catapults and sticks, and are wearing masks. Security forces have uprooted and confiscated some of the belongings and tents set up by the protesters during the sit-in and at least 67 injured have been taken to different hospitals including 58 to Pakistan Institute of Medical Sciences (Pims) and 7 to Benazir Hospital. Administrator PIMS Dr Altaf Hussain stated that none of the injured brought to the hospital was in precarious condition. Meanwhile, an emergency has been imposed in all the hospitals of the twin cities and staff has been advised to remain on duty. Prison vans, ambulances are at the site, while helicopters and drones are being used by the authorities for aerial surveillance. Protesters have blocked Bhara Kahu leading to Murree. They have also set fire to two vehicles at Faizabad Chowk. According to district administration sources, the Faizabad interchange is now in control of authorities as the operation is still underway. Security officials are conducting operation against the protesters from five directions: Khanna Pul, GT Road, Islamabad Club Road, Express Highway and Murree Road. The schools at the Murree road have been evacuated while markets and commercial plazas in the vicinity have been shut down as well. The Pakistan Electronic Media Regulatory Authority has barred television channels from covering the protest in real time. The embargo which was placed to ensure the safety of newsmen was placed hours after the law enforcers launched a crackdown. Soon after the Islamabad police launched the crackdown, religious groups through social media platforms advised their protesters to take to the streets after which members of Tehreek-e-Labbaik blocked different thoroughfares. The demonstrators blocked roads leading to Data Darbar Lahore whereas protests were also staged in Okara, Burewala and other cities. The local administration of Islamabad had warned the religious groups staging a sit-in at the Faizabad interchange of action for not vacating the thoroughfare. According to a letter addressed to the leaders of religious groups, the administration had ordered the protesters to leave the place by 12 midnight (Friday), otherwise, the ‘leaders and the attendees would be responsible for consequences’. It also stated that the Parade ground adjacent to Faizabad was allocated for demonstration as per the directives of judiciary and warnings were issued to the protesters twice to call off the sit-in. Multiple religious groups including Tehreek-e-Labbaik Pakistan had staged a sit-in at the Faizabad interchange as a protest against the amendment regarding Khatam e Nabuuwat clause in the recently passed Election act 2017. Although the amendment was re-amended and the said clause was restored in original form, even then the protesters demanded to identify the individual who was behind the controversial move. The Islamabad High Court while admitting a petition regarding the clause ordered the protesters to call off the sit-in, however, they refused to comply. The Supreme Court had also taken suo-moto notice and sought a response by the relevant officials. According to a report submitted by the Inter-Services Intelligence (ISI) to the Supreme Court, the religious groups staging a sit-in were pursuing political motives. The spy agency revealed that the protesters had taken to the streets in a bid to gain popularity ahead of the next general elections. 0 Response to "Cop dies, over 190 injured amid Faizabad operation to uproot Islamabad sit-in"